Xilisoft DVD Audio Ripper can effortlessly realize your wish to rip DVD and convert DVD to all popular audios such as DVD to MP3, WMA, WAV, M4A, AAC, AC3 and OGG for different digital players. As professional DVD audio ripper, it surely supports extracting audio segment from DVD. you can preview the DVD with a built-in player and take a snapshot to save the picture you love. You can edit ID3 tag for your DVD sound with DVD Audio Ripper. Listen to favorite movies and concert DVD with your portable audio player. 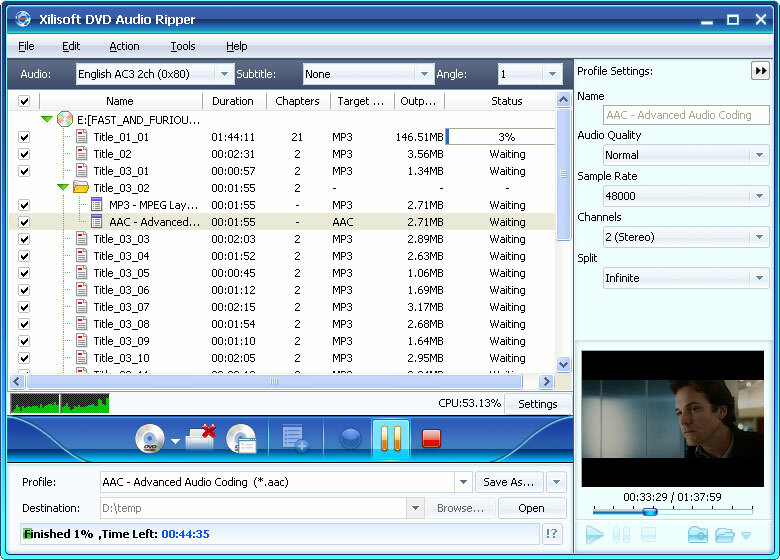 ...... Free try Xilisoft DVD Audio Ripper now to experience the amazing sound quality. * The output formats MP3, WMA support ID3v1 and ID3v2. Qweas is providing links to Xilisoft DVD Audio Ripper 5.0.62.0305 as a courtesy, and makes no representations regarding Xilisoft DVD Audio Ripper or any other applications or any information related thereto. Any questions, complaints or claims regarding this application Xilisoft DVD Audio Ripper 5.0.62.0305 must be directed to the appropriate software vendor. You may click the publisher link of Xilisoft DVD Audio Ripper on the top of this page to get more details about the vendor.